My husband and I both recently received our Master’s degrees in our individual fields — his in Business Management and mine in Education. Our educational pursuits came at a time of great transition for our family and wouldn’t have been possible without a financial decision made early on in our marriage. My husband and I were married three and a half years prior to our first child being born. After lots of prayer and discussion immediately after we were married, we felt it was the best thing for our family for me to stay home (at least part-time) once we had children. I finished up my last year of college that first year of our marriage and we were used to living on just my husband’s salary. After graduation, I was offered the wonderful opportunity of teaching first graders — a job I truly loved. Once those monthly checks came in it felt like we had tons of money! Remembering our desire for me to stay home once we had children, we decided we would to continue to live on just my husband’s salary and elected to have my salary directly deposited into a savings account (that way we wouldn’t be tempted to spend it). This might have been the single best financial decision we have ever made. After being a first grade teacher for one year, I soon realized that the only way to increase my salary was to receive more education, so I decided to enroll in a Master’s degree program at a nearby university. During this time, my husband worked for a company that reimbursed 100% of tuition fees for a Master’s Degree program. My tuition, however, was our responsibility. Thanks to our decision to save my income, we had built up a nice nest egg and were able to pay cash and still have money left over in savings. I graduated with my Master’s degree just three months after our first son was born and resigned at the end of that school year — a choice that wouldn’t have been possible without three years of saving! Even though I resigned immediately after graduation and have yet to receive any monetary incentive, I know that I will return to the classroom someday and will continue to reap the rewards — both monetarily and in knowledge. Plus, it helped prepare me to be able to start my blog with learning activities for parents of young children called ! A year after our son was born and right in the middle of my husband’s MBA program, he was presented with a new job opportunity. This new position had better pay and benefits, but no longer offered tuition reimbursement. After prayerful consideration, we decided it was in his best interest to go ahead and finish, even though the cost was steep. This was quite a stretch for us, since we had gone from two incomes down to one, but we felt convinced it was the right thing to do. Kevin graduated this past May with his MBA and we didn’t go a penny into debt in the process! We are so thankful for our decision to save all of my income for three years — it has allowed me to stay home with our two children and paid for both of our Master’s degrees! Jenae is a wife, mother of two boys’ ages 2 ½ and 11 months, and former first-grade teacher. She loves spending time with her family and sharing fun and educational activities for young children on her website . Have you saved up and paid cash for something — large or small? . Looking for more? 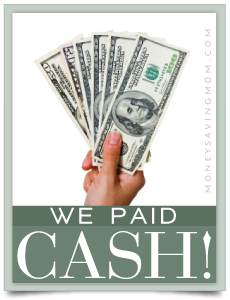 Read more posts about We Paid Cash. That was the best advise we received when we got married. my mom advised us to only live off my husbands salary. so we never factor my income into the budget. my paychecks go directly into a separate account that helps to pay for his school and is savings for the future. this has been an amazing blessing especially since i hope to work part time or stay home full time when kids come along! We also lived my husband’s salary only when I was teaching. Best decision. It was tempting to spend it on better living, but since I knew I wouldn’t work after kids, it was good to not get used to a higher standard of living that we would not be able to keep up. Plus, that money from one year of teaching made up most of our down payment on our house – which meant that our payments are low – helping us to live better now. How funny to see this today, since yesterday my husband and I sat down to figure out how to pay for my degree. I have a bachelor’s degree already, but I am completely miserable and realized I need to go down a different career path. My options for financial aid are limited, and I really don’t want to take out any more loans since we’re still paying on the one for my first degree. It’s nice to see that someone made it work! Another good option for college is to go to a state school vs a private school if possible, I’ve attended both and they both have their pro’s and con’s, but its still an education! and state tuition is so cheap that with fin aid and TAP, i ended up going for free! Similar to you, both of us earned our Masters – I’m a teacher, my husband got his MBA> We are still paying student loans for it but I am so glad we both have them. Have you thought about when you will return to the classroom. For me, they hold my job until my baby girl is 2. I cannot go back full time and think about what I’ll do all the time. It’s really hard to get a teaching job these days. Natalie, I plan to return once both boys (and any future children we might have) are in school. Thanks for your comment! I am also a teacher and my husband and I are both working on our master’s degrees right now as well. We are also still paying student loans for our undergrad. About a year before I started my program I set up to have $400 taken out of my paycheck every month and put into a savings account because I knew that would add up and we would be able to pay per class for my classes as I went. Luckily my husband works for a university and he is working on his MBA for free (except for books). So I am about to finish and we have not gone into further debt, and we’ve actually built up our savings during this time as well and will hopefully pay off our undergrad loans within the next year! That’s great! My husband is working on his Masters, with a PhD in the plans. I’m at home with our kids, but we’ve still managed to slow down the amount of student loan money we’re borrowing, and last January we had enough saved up to pay for his current semester of tuition. If everything goes as planned, we should be able to cash flow the rest of his Masters, and with some luck he’ll be offered full funding for his PhD program. We’re focusing on not digging deeper into that student loan hole, one semester at a time. У нашей компании авторитетный блог с информацией про www.service01.com.ua.